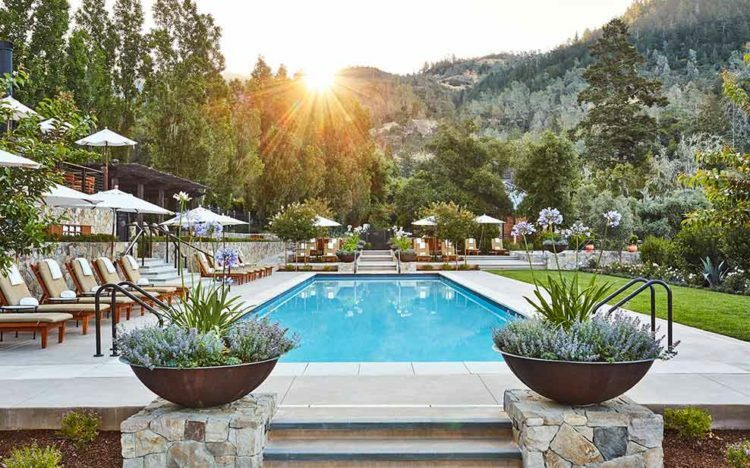 Dive into the heart of wine country where a peaceful and secluded paradise awaits: Calistoga Ranch, an Auberge Resort. 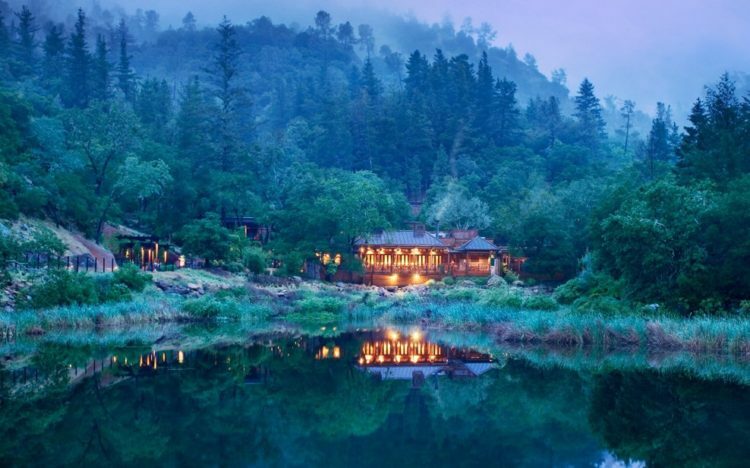 Nestled into a private canyon in the Upper Napa Valley on a 157-acre site, this five-star resort features 50 free-standing lodges surrounded by towering ancient oak trees, beautiful hills, a rocky stream and a private lake. 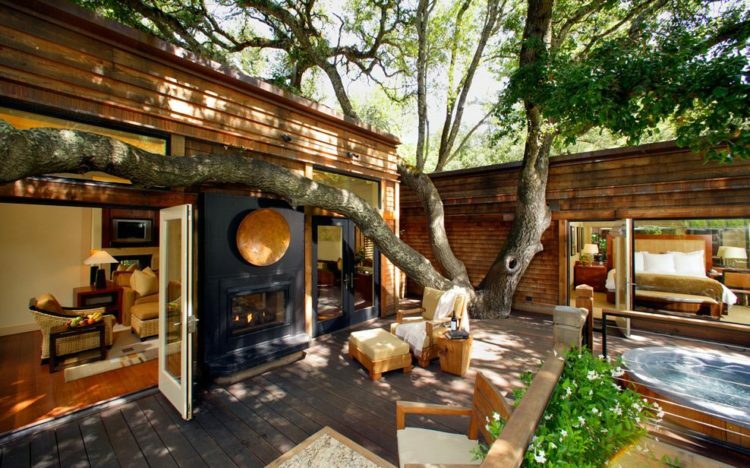 Accommodations blend the indoors with the outdoors and beautifully mix the rustic with upscale luxury. Amenities include expansive cedar decks, rich polished woods, floor-to-ceiling windows showcasing the surrounding pine trees, outdoor rain showers and fireplaces. Opt for prime luxury with the two-bedroom, two-bath lodging that offers 2,400 square feet of relaxing space. With its prime Napa Valley location, the culinary scene at Calistoga Ranch is Wine Country cuisine that uses locally sourced organic ingredients from local farmers throughout Northern California and Napa Valley. The wine selection features everything from California favorites to traditional Bordeaux. As if the flavors weren’t enough to entice you, the resort’s signature restaurant, The Lakehouse Restaurant overlooks Lake Lommel and features indoor and outdoor seating, glass walls and large decks to take in the California air. The Lakehouse Lounge and pool terrace also offer casual grill selections, crafted cocktails and of course, more wine. Pro Tip: Get cozy in a secluded area of the resort, like the wine cave or under the stars next to a fireplace, and allow the culinary team to plan a private customized tasting menu for two. Take full advantage of the relaxing location and wander down to Napa Spa that’s tucked into a wooded canyon on the banks of Lake Lommel. 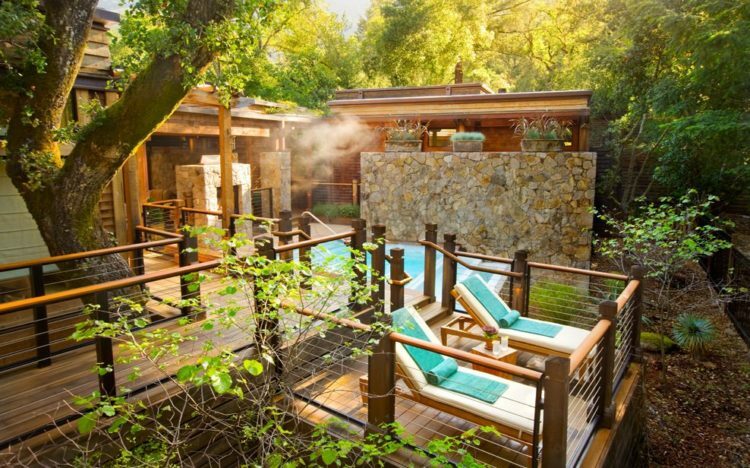 The spa focuses on the healing waters of Calistoga with soaking pools overlooking creeks, private water massages and complimentary fitness classes. Guests can also take advantage of a variety of activities like hiking, cooking classes, winery tours, championship golf, biking and jogging routes through vineyards, horseback riding and hot air balloon rides which are followed by a champagne breakfast, and much more.